Buy through MusicWeb £14.80/15.60/16.10 postage paid. 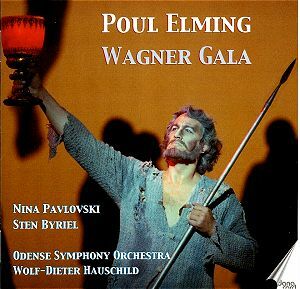 Poul Elming began his career as a baritone at the Danish National Opera in Aarhus. From 1984 he was at the Royal Opera in Copenhagen, where he has been one of the mainstays ever since. In 1989 he changed to tenor, making his debut in that capacity as Parsifal. From then on he has been increasingly sought after in the big houses around the world. He sang at Bayreuth for twelve consecutive years and his Siegmund is immortalized on both CD and DVD in the Barenboim/Harry Kupfer production. This is, as far as I know, his first solo disc. Appropriately enough two of his signature roles (Siegmund and Parsifal) occupy the greatest part of the generous disc-space, but it is also good to have him in what can be regarded as a character role as Loge, especially since he is now taking on pure character parts at the Royal Opera. This autumn he will be singing Benoit in La Bohème. His blonde voice – a lyrical timbre with heroic ring – is well suited to this multifaceted character: sly, oily and scheming. It is a vivid interpretation with excellent enunciation, detailed and beautiful. His Siegmund has certain similarities with Set Svanholm, another Nordic baritone turned dramatic tenor and who as such had a world career in the 1940s and 1950s. He had the blonde tone, the youthful timbre and steely top notes, but where Svanholm impressed with his invincible brilliance, Elming is more restrained, even though he has the power for Siegmund’s cries Wälse! Wälse! Wo ist dein Schwert?. They are marginally more strained than with Barenboim but still spine-chilling. What makes him stand out is the lyrical quality, the care about nuance – and he certainly sings very beautifully. Winterstürme is also mainly sung as a "love in spring-time" song, lyrically, warmly and with an unaffected naturalness, free from histrionics and shouting. The rest of the disc is occupied by four excerpts from Parsifal, even though the track-list gives the impression that it’s more. In fact tracks 5 to 10 comprise the almost 40-minute-long duet between Parsifal and Kundry in act 2, wisely enough fitted here with a number of cue points. Before that we get a well-shaped reading of the prelude to act one, beautifully played under the experienced Wagnerian Wolf-Dieter Hauschild, who in the vocal excerpts is sensitive to the singers’ needs. The long duet opens with a lyrically restrained Parsifal and then we meet Nina Pavlovski’s well sung and well acted Kundry. She sings a nuanced Ich sah das Kind (tr. 6), sometimes shrill at forte but tonally well-balanced. Her big scene (tr. 9) is a splendid example of acting with the voice. As the intensity grows during the course of the long duet, so does also Elming’s voice which adopts more than a hint of the baritone he once was. To round off the disc we get two passages from act 3. First the meeting between Parsifal and Gurnemanz, well characterized by Sten Byriel, who also is briefly heard as Titurel in act 2. Then comes Parsifal’s Nur eine Waffe taugt and here he is again youthful and lyrical – a beautiful end to this very attractive disc which thanks to one long unbroken scene is something more than the common assemblage of ‘bleeding chunks’. There are only a few tenors around in this repertoire with these vocal qualities and this ability to bring out the nuances in Wagner’s music. We have to be grateful when a singer of this calibre gets a disc of his own. Danacord, Poul Elming and all involved have to be congratulated on the result!